OFI will have a broad impact across the Northwest Atlantic region and in ocean science around the world. That’s the phrase Aldo Chircop chooses to describe the Dal-led Ocean Frontier Institute and, in particular, its financial support from the Government of Canada. 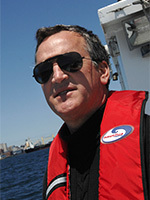 A faculty member in the Schulich School of Law and the Canada Research Chair in Maritime Law and Policy, Prof. Chircop is passionate about the need for a more robust 21st-century framework for studying the ocean. At the other end of campus, Biologist Boris Worm knows as well as anyone that great science often comes from great teams. 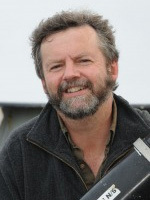 But he also knows the sort of teamwork required to address the challenges of a rapidly-changing ocean — issues like climate change, global food production and access to the Arctic — needs to be more collaborative, more interdisciplinary than ever before. 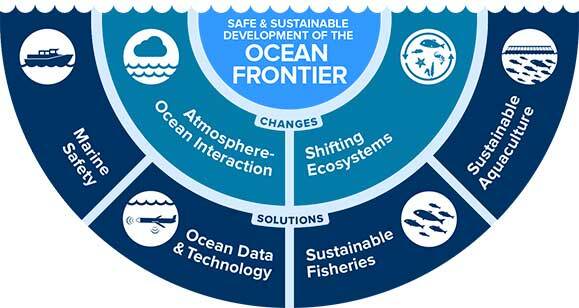 So what exactly is the Ocean Frontier Institute? In dollars and cents, the Ocean Frontier Institute (OFI) is an unprecedented investment in Canadian ocean research. On Tuesday, September 6, the Government of Canada announced $94 million in funding for OFI through its Canada First Research Excellence Fund — the largest research grant in Dalhousie’s history. To that, OFI adds an additional $125 million in funds committed from its various partners, including a $25 million gift from philanthropist John Risley to support OFI operations. That makes it a $220-million project, a scale of ocean research the likes of which Canada has never seen before. As a collaboration, OFI is transformative in its scope. At its heart is a new partnership between Dalhousie, Memorial University of Newfoundland and the University of Prince Edward Island. It then links this Atlantic Canadian ocean expertise with national and international partners. 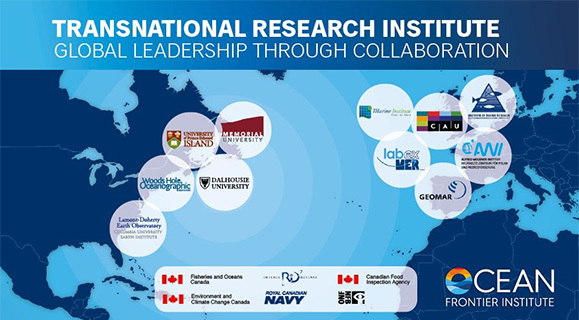 OFI includes eight international ocean research institutes (including four of the top five in the world), three Canadian federal departments, the Royal Canadian Navy, the National Film Board, the Nova Scotia Community College and 19 industry partners ranging from local small businesses to international corporations like IBM. But understanding what OFI represents — why it’s set to become one of the world’s most significant ocean science collaborations — requires an appreciation for the importance of its area of focus: the Northwest Atlantic and Canadian Arctic gateway. The Northwest Atlantic is a place where ocean changes are happening first and fastest. It’s home to highly productive marine ecosystems and one of the most active carbon sinks on the planet, helping mitigate and respond to climate change yet also causing chemical changes to the water, the consequences of which are not fully understood. The Northwest Atlantic also produces 72 per cent of Canada’s fish and seafood exports, hosts major international shipping routes and is Canada’s gateway to the Arctic, critical for global security. OFI is a key milestone in Dal’s long and impressive history of ocean research. Its core foundation was built over 50-plus years, but during the past decade a number of new initiatives have served to strengthen Dal’s ocean research capacity and enhance its international connections‎: the Dal-led Ocean Tracking Network, launched in 2007; the 2011 awarding of a Canada Excellence Research Chair in Ocean Science and Technology, held by Doug Wallace; the 2012 launch of MEOPAR (Marine Environmental Observation Prediction and Response), a Network of Centres of Excellence focused on ocean hazards; German Chancellor Angela Merkel’s visit to campus that same year, where she signed an agreement between Halifax and Germany in ocean research and technology. Then came news of the federal government’s Canada First Research Excellence Fund competition: a total of $1.5 billion in available funding targeting university-led projects that would help propel Canada to global prominence in particular fields of expertise. Starting in 2014, Dr. Crago and a team of researchers across Dalhousie began discussing how this funding opportunity could propel Dal’s ocean research momentum into overdrive. 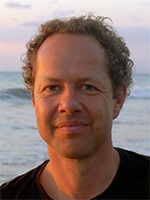 GEOMAR and Germany’s Christian-Albrechts-Universität in Kiel would become two of the eight international institutes involved in OFI; together with the Woods Hole Oceanographic Institution in Massachusetts and Columbia University’s Lamont-Doherty Earth Observatory, they represent four of the top five highest-ranked ocean research institutes in the world. But OFI would also need to leverage Canadian expertise. As the project took shape, it began to build the framework for a new institutional collaboration with Memorial University of Newfoundland and the University of Prince Edward Island. Each brought something important to the table. 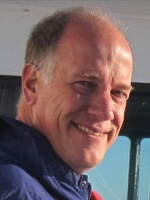 In UPEI’s case, it was the team of Ian Gardiner, Canada Excellence Research Chair in Aquatic Epidemiology, and its research on aquaculture and marine disease control and prevention. Memorial offered scientific and applied strength in offshore fisheries, aquaculture and coastal community engagement. The core of OFI is built around 17 interlinked research modules, each tackling a different ocean topic or challenge from an interdisciplinary perspective. Through these, OFI will provide funding to support research and deliver data science and technology tools to policy-makers, scientists and industry. Some of the areas where OFI hopes to make an impact include: improving prediction and mitigation of major storms; better management of the ocean’s living resources; more sustainable approaches to aquaculture; marine transportation policy and risk reduction; and new data capture and IT tools to monitor the ocean. At the same time, OFI will offer a series of interrelated programs to enhance Canada’s ocean expertise and help educate future ocean scientists, leaders and innovators. These include a training program for PhD students and postdocs, a visiting fellows initiative and the previously announced Ocean School, an education partnership between Dalhousie and the National Film Board. 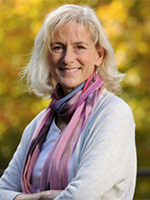 Overseeing all of this activity will be OFI’s CEO, Wendy Watson-Wright. 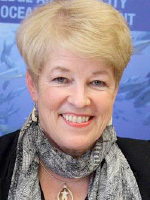 A three-time Dal alum, Dr. Watson-Wright comes to OFI from Fisheries and Oceans Canada (DFO) where she served for a number of years as DFO’s assistant deputy minister of science, and most recently worked as regional director-general for the Gulf Region. 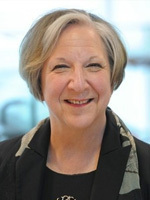 She has significant international experience, having led UNESCO’s Intergovernmental Oceanographic Commission as executive secretary and assistant director general from 2010 to 2015. 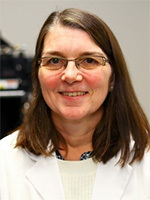 “We have the best in the world in this collaboration at OFI,” says Dr. Watson-Wright. “I know we can be a global leader in the many facets of ocean research and education, and we are thrilled to have been given this opportunity." 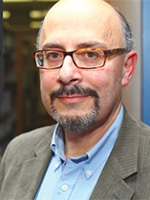 Assisting her in guiding OFI through its initial months will be Marlon Lewis, set to lead OFI’s research program until a permanent scientific director can be recruited. A veteran of Dal’s Department of Oceanography for more than three decades, he is also the founder of Halifax ocean technology company Satlantic. It’s this broad network of connections — between universities, international institutes, government labs, industry — that has so many in Dal’s research community excited by OFI’s potential. “It’s going to just exponentially explode the ocean research capacity at Dalhousie, and with such strong national and international partnerships, it will be one of the most significant international institutional efforts ever put forward for the ocean.